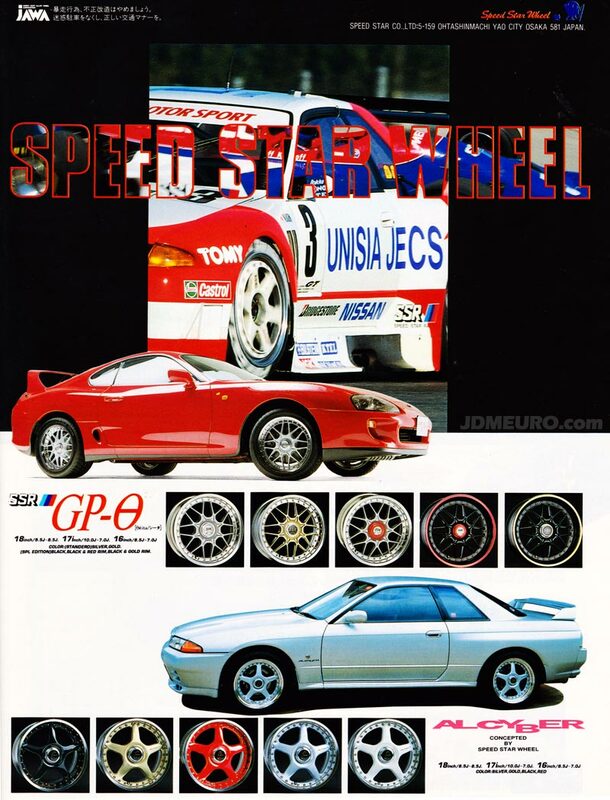 JDM Wheels – SSR GPO & SSR Alcyber by Speed Star Racing. If you were an old school JDM Wheel Whore in the mid-late 90’s you have to know everyone wanted two wheels, the SSR GPO and the Racing Hart Type-C; here is a rare wheel scan of the SSR GP-O and SSR Alcyber. Some people have referred them as SSR GP Omega due to the greek symbol, but that is actually a Theta symbol to make it the SSR GP Theta. The SSR GP-O is a two piece mesh wheel with a faux centerlock design really being the center cap; a very popular design at the time. The SSR Alcyber is the 5 spoke brother to the SSR GPO also with the faux centerlock center cap. Both wheels state sizing from 16×7 to 18×9.5, but I have seen 16×6.5 and 18×10 from the Speed Star Racing factory. Now does anyone else see similarities in the SSR wheels GPO and the Racing Hart Type C; or the SSR wheels Alcyber and Racing Hart Tracer? Well just about every JDM wheel manufacturer had a mesh and 5 spoke design at this time.